Stainless Steel Fitting Connector for Square Tube 1-9/16" x 1/16"
This INOX Fitting fits a 1/16" internal diameter. Stainless Steel Anchorage For Tube 1 1/3" Dia. 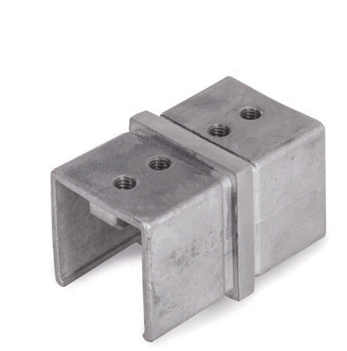 x 5/64" Stainless Steel Anchorage With Flat Surface Pivotable Stainless Steel Pivotable Connector for 1/2" Bar w/ Set Screws Stainless Steel Flange Canopy 2 63/64" Dia. x 37/64" Dia. Hole x 1/2"
316 Stainless Steel Mounting Plate 45 Degree, For 1 1/3" to 1 2/3" Dia Tube Stainless Steel End Cap Decorative Semispherical for Tube 1 1/3" Dia., M8 Thread Stainless Steel Handrail Support 2 61/64" x 2 61/64", 1/2" Dia., With Rigid Mounting Plate Stainless Steel Handrail Support Elbow 90d Angle 2 61/64" x 2 61/64", 1/2" Dia.